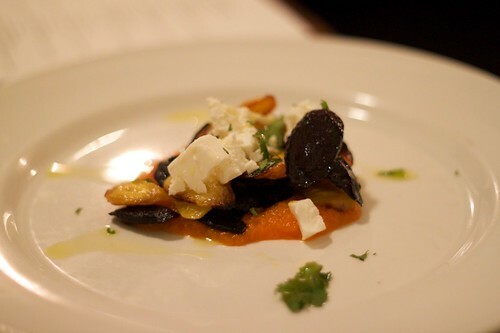 For the second course, both our courses were similar – both had roasted heirloom carrots as a main ingredient. However, mine was dressed with carrot puree, raisins, coriander and feta, whereas Tristan’s had chorizo, prawns, and prawn bisque sauce. Just reading back on these descriptions, I prefer the sound of mine though I was worried about the use of raisins (am not overly fond of them). But wow: coriander and feta? An unlikely but most pleasing pairing. I’ve chosen to show the vegetarian version of the dish, but you can also view the omnivore version here – it looks a good deal different. Stay with me! Tristan’s third course was easily the best course out of the degustation. 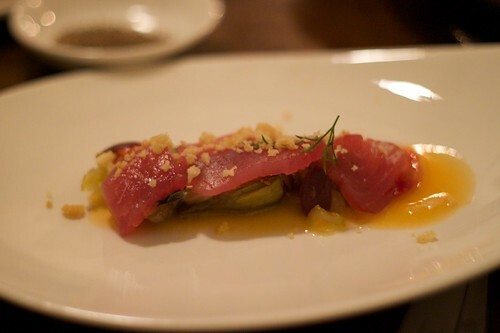 Yep, I called it that early too, honest: confit artichokes, cured tuna, blood orange, olives and pangrattato. I was given one mouthful of this and it was the sort of mouthful you wished went on forever. Goddamn near flawless. I say near flawless because music school has ruined me and nothing can ever be perfect. I hate you, music school. 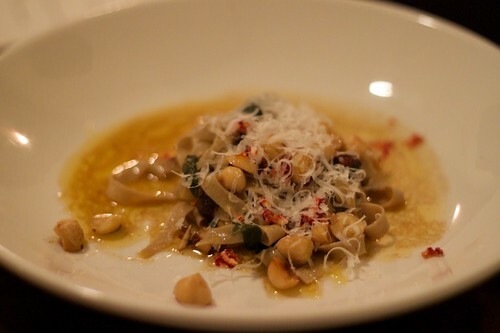 Meanwhile, I had chestnut flour tagliatelle with hazelnuts, sage, butter, lemon, pecorino and dried orange. I don’t believe it was on their beer list, but perhaps Bridge Road’s chestnut pilsner would have been a good match? The dish may have helped to bring out the chestnut? It’s a wager. The dish was wonderfully delicate and subtle. Time for the meat dishes, at least on Tris’ end – tea smoked duck breast and steamed duck leg in a congee with pickled cabbage, shallots and spring onion oil. Possibly the fanciest congee known to man. I was served a dish based on that famous ‘meat for vegetarians’. Sadly, I couldn’t find a video clip online of the advert that coined that phrase, so I instead present a link to Sam Neill dancing to inform the public that we were meant to eat red meat. I much prefer him dancing to killing me Event Horizon-style. I digress: I present to you fried silken tofu with kombu and shittake mushroom broth, assorted seaweed and autumn vegetables. 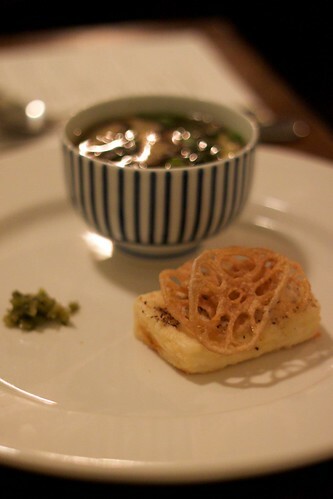 My favourite course out of my degustation – such a heavenly hit of umami. Incidentally, the Japanese theme continued into Tristan’s next carnivore course (fret not, Sam!) – Sher wagyu with dashi braised eggplant, daikon, spring onion, soy beans, ginger and miso sauce, finished with kombu relish. 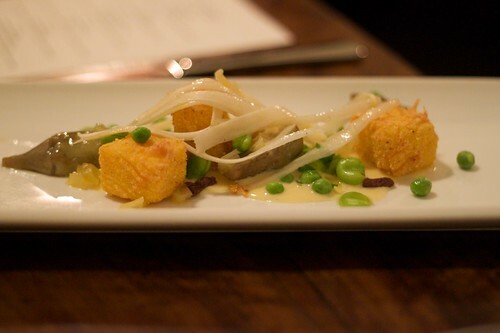 My last savoury course harkened back to the Italian slant of the chestnut tagliatelle – fried polenta, spring vegetables, parmesan cream and tapenade. 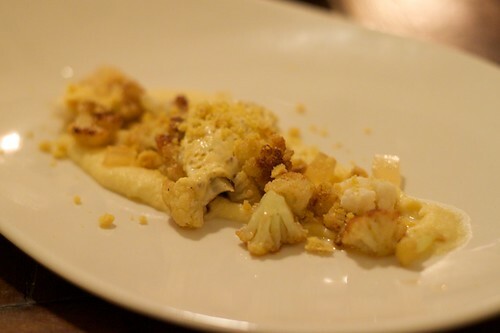 The texture of the polenta coupled with the parmesan cream was just divine. 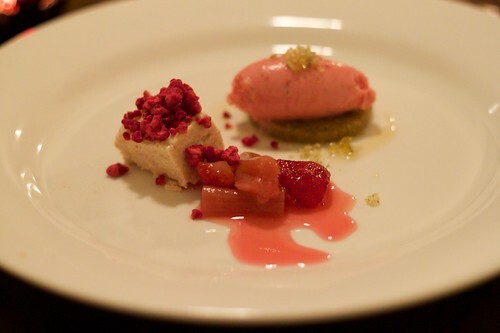 Both desserts appeared to be vegetarian-friendly, and I really, really wish I asked to have the same dessert as Tris – the rhubarb mousse, strawberry and yoghurt sorbet with strawberry and rhubarb salad, green tea syrup cake and salted green tea praline. 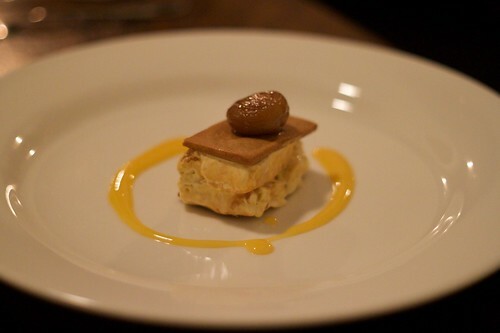 As I snatched longing looks at Tris’ dessert, I struggled with my own: honeycomb parfait and pain d’épice sandwich, candied chestnuts and citrus sauce. Struggle because the biscuit-type sandwiching part was very, very difficult to actually break with a spoon. I confess this did detract slightly from enjoyment of the dessert. I’ve kept my descriptions of the dishes pretty brief but this has been deliberate. 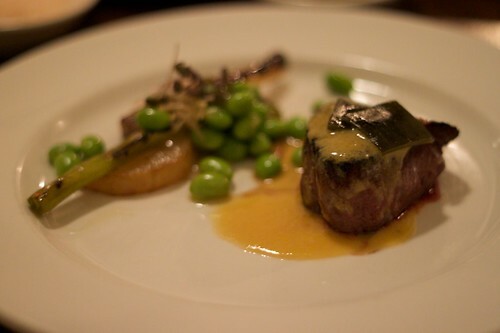 It’s not easy to be so brutally honest, but I would not come up to Beechworth specifically to dine at Provenance. While the dining experience was great, the courses were a tad too ambitious. I would have preferred concentration on a smaller number of flavours in each dish. It wasn’t necessarily sensory overload, but sometimes the competing tastes were just a little muddy. The autumnal theme was nice and the progression of the courses felt themed, which I really liked. I also found the service glacial, though at all times polite – particularly while I was waiting for my partner. Yes, I understand that I wasn’t dressed in my Sunday best when I went but even for me I was unusually well-behaved. These things aside, if I were to go to Beechworth again, I would definitely be looking to dine here again and see what the à la carte menu has to offer. I resent the sentiment that Provenance is good dining ‘for the country’. Admittedly it hasn’t matched similar such dining experiences I’ve had in the city, but this is incidental. It probably doesn’t help that I compare it to beloved Attica… (there are similarities in the aesthetic approach) though Provenance’s use of ingredients is more rustic. Though I can’t find any online sources to confirm (and I searched, I swear! ), I thought I read that head chef Michael Ryan worked at Attica? I appeal to you, my readers for confirmation and/or correction. The night didn’t end here – we both returned to Tanswells to see our beery acquaintances doling out their funds on the local beer. I am absolutely gutted that I missed out on trying the Bridge Road bière de garde on handpump! Groan. It was named one of the beery highlights of our trip, the other being the B2 Bomber. Honourable mention was awarded to Bright Brewery’s Staircase porter, but more about that next post. I should not have attempted that post before breakfast (indeed, when there is nothing remotely food-like in the house). As we’re probably unlikely to head Beechworth-wards, this is the closest I’ll get to the food, so thanks for the post. No thanks to you, though, for putting that “meat for vegetarians!” in my head. I can even here the way it was said. Aargh! Shane McGowan is helping banish that earworm. Haha, I got a similar complaint from @essjayeff! You must go to Beechworth, I actually want to go back – where I stayed is very conducive to writing. Yeah, that “meat for vegetarians” campaign was arse, wasn’t it? I’m genuinely surprised I couldn’t find it online. Amazing that you can often fail to enjoy the delights that are on your own doorstep. Over the years we have certainly enjoyed most of the destinations in Beechworth but clearly it is time to revisit them once again.